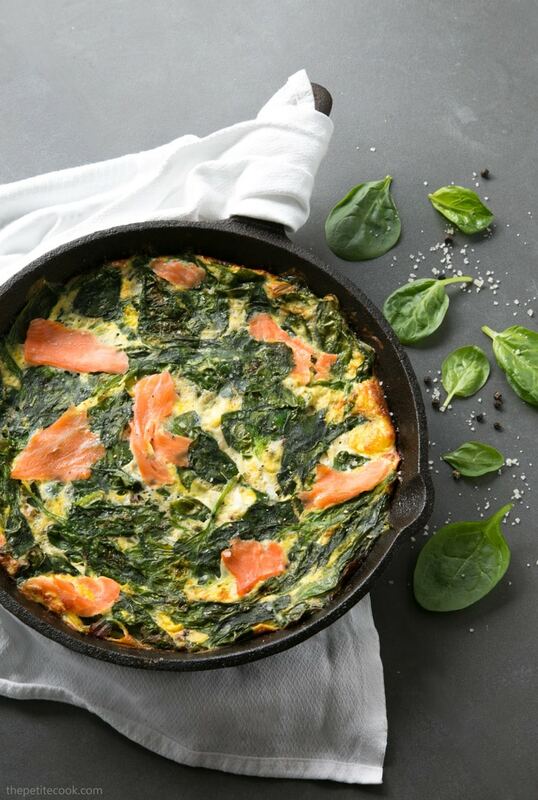 This Crustless Salmon and Spinach Quiche makes a quick, comforting no-fuss meal – Ready in 30 min, it’s a great gluten-free breakfast, lunch or dinner option. What I love about crustless quiches is that they easily come together in just under 30 mins, and make a great gluten-free option for a tasty breakfast, or for a quick-fix lunch paired with a salad. One of my favorite ways to enjoy it, is over brunch during the weekend. But it would also make a nice starter or side for any week-night meal. The possibilities for quiche fillings are endless. For this spinach and salmon quiche I’ve used 10 very simple ingredients including: fresh free-range eggs, crème fraîche, milk, spinach leaves, organic smoked salmon, parmesan, onion and fresh aromatic herbs such as basil and thyme. If you want to jazz up the recipe, add some other veggies to the quiche, pumpkin would make a great addition this time of the year. 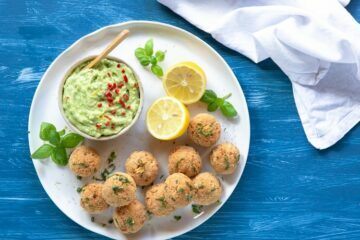 Play with the cheeses too, I like to stick to one or two, I usually go for grated Parmesan or cheddar, soft goat cheese or crumbled feta. They’re all easy to find, with flavors that work well in a quiche. Feeling indulgent? Go on and add a crust over the base. This simple short-bread is my go-to recipe when I’m feelin’ all crusty about it. If you’re up for the simple things like me, all you have to do is mixing all the ingredients together. Pour them over a hot cast iron skillet and finish off the quiche in the oven. One bowl, one skillet, no mess, and no scary flip-overs. I absolutely love making this quiche, especially because I buy tons of fresh spinach, and I often have leftover smoked salmon in the fridge. These two guys work very well together for all kind of recipes. One of my favorites? 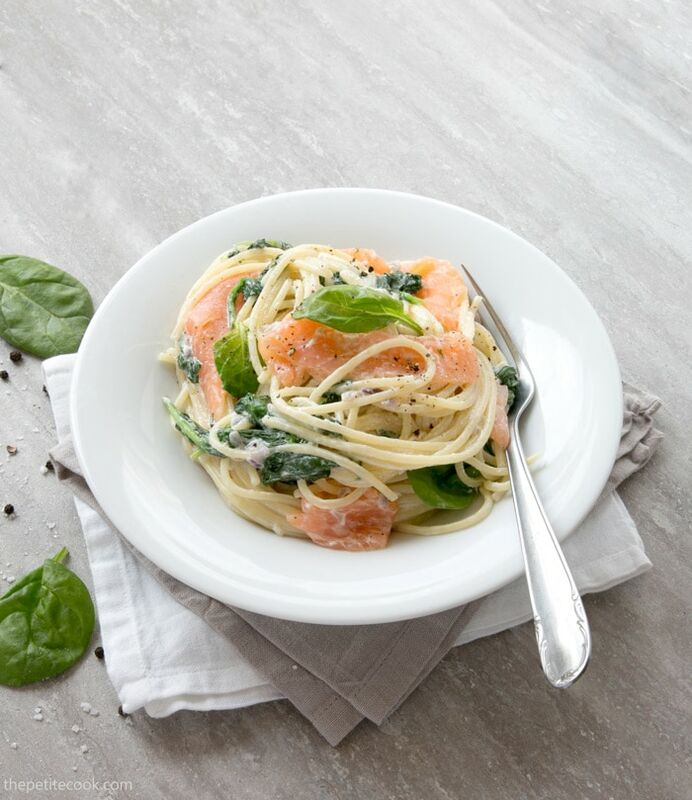 These creamy spinach and salmon spaghetti – delicious, rich and ready in a snap too! Whichever way you go, both these recipes will easily become a family favorite. I mean, what’s not to love? They’re so quick, easy and packed with flavor, you’ll want to make them over and over again. 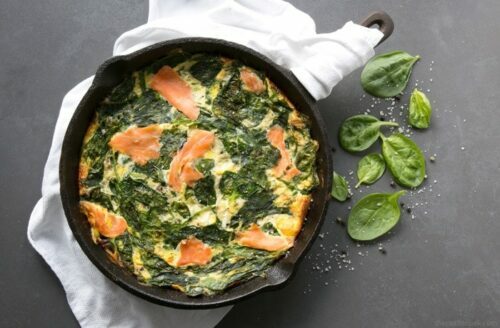 This Crustless Salmon and Spinach Quiche makes a quick, comforting no-fuss meal - Ready in 30 min, it's a great gluten-free breakfast, lunch or dinner option. Melt the butter in a cast iron or ovenproof skillet over medium heat. Add the extra virgin olive oil, followed by the sliced onions and garlic. Cook the onions over medium-low heat until golden-brown, and starting to caramelize. Add a splash of water if you see they're browning too much. Remove the pan from the heat and distribute evenly the onions across the bottom. 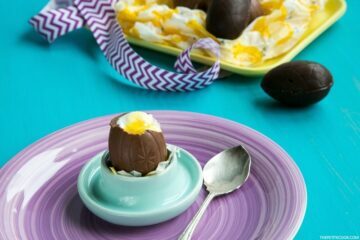 In a bowl, with the help of a fork beat the eggs lightly with the milk, crème fraîche, parmesan cheese, ½ teaspoon of sea salt, and ½ teaspoon of pepper (or to taste). Fold in the spinach leaves and chopped salmon and lightly combine all the ingredients. Pour the mixture over the onions, distributing evenly the spinach and salmon. 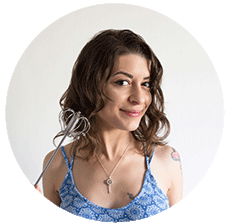 Transfer the crustless quiche to the oven and bake for 20-30 minutes. The quiche will be fully cooked when both edges and surface are lightly brown. Allow the quiche to cool for about 10 minutes, then slice into wedges and serve. Hi there , made this for dinner but adding salt as described in recipe made it way too salty overall, which was a shame as was otherwise a nice recipe. We love quiche or frittata for brunch on the weekend! I’ve never tried it with smoked salmon. Love the spaghetti option too. Saving to try soon! I put smoked salmon both in frittatas and quiches and love the extra smoky flavor 🙂 Hope you try the spaghetti, it’s on of my all time favorite recipes! Looks super delicious. It’s definitely something I will try because I love salmon. Lovely photos btw;) Sharing this off course. I love salmon and I love quiche, this would my ideal lunch!!! I will have to make this soon! Smoked salmon- one of my favorites! Thanks for the recipe and the no crust route. I’ve been eating way too much pie crust! I also like the spinach combined with the rest of the ingredients! You know I just made my first crustless quiche this week. Totally loved it. I had a bunch of odds and ends in the fridge I had to use up. They make the perfect and easy weeknight dinner. This one sounds so delicious. My husband loves smoked salmon…I will have to make him a special brunch on the weekend. I love this crustless quiche!! 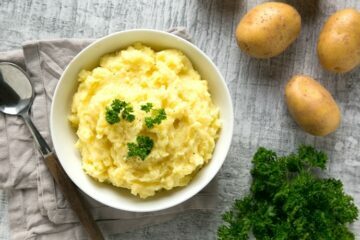 It’s fast, easy and delicious!! Thank you! Can’t go wrong with crustless quiche, always a winner!